At CPAC 2012 held in DC this weekend, I had the opportunity to hear two speakers most celebrated by the Tea Party–Andrew Breitbart and Sarah Palin. That they are both celebrated and completely unhinged speaks volumes about the Tea Party. They just can’t give up the crazies. 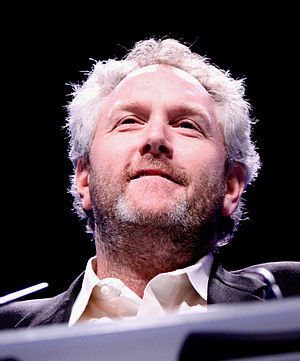 No one really needs proof that Andrew Breitbart–purveyor of website BigGovernment.com and promoter of the highly edited O’Keefe videos–is mean, paranoid and totally off his rocker. But if proof was needed, he gave it to us in spades. After his CPAC speech, Breitbart came out to greet DC Occupy protestors in front of the conference site. This video shows a meltdown of epic proportions. Palin and Breitbart always toss plenty of red meat to the true believers, and they didn’t disappoint. Flush with vitriol toward President Obama, they unloaded their particular mix of aggressive insults and victimology. Key among their buzzwords was “radical”–that Obama is a radical, that radicals “are at war with you.” The word was guaranteed to rile up the troops and get a standing ovation. None of this is new. I was eager instead to get their take on Occupy. Palin has always been on the right side of one issue, at least rhetorically (mangled syntax or not): corruption in politics. She is fully in line with Occupy when she calls out “crony capitalism,” corporate welfare and bailouts. She perceives to some degree that she and Occupiers are in agreement on this, but advises them that they are “occupying the wrong place, you’re protesting the wrong thing.” The right thing to protest, she says, would be Obama, that epitome of Chicago machine politics–“the champion of power players.” To Palin, Breitbart and their Tea Party sycophants, all evils lead back to Obama. What she fails to understand is that Occupy doesn’t support Obama or Democrats in the least. Breitbart could use Glenn Beck’s chalkboard to more persuasively draw the lines between Occupy and Democrats, George Soros or whomever. Palin will use Occupy to flog Obama in the same tiresome ways as always. If Tea Partiers manage to grab the microphone again, depend on hearing a lot of conspiracy theories about Occupy.